Thursday could have been a whole lot worse for Hong Kong’s equity market. While Tencent Holdings’ shock profit slump caught almost all analysts by surprise, traders were far more prepared. They’d been selling the shares at the fastest clip since February, paying up for bearish derivatives and increasing their short positions to hedge against further declines. That paid off: the stock was down as much as 5.1% in early Hong Kong trading Thursday, exactly the move predicted by the options market. 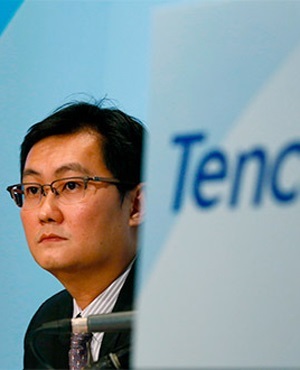 Lessons from March’s earnings release - when wild derivatives trading showed how Tencent’s weak guidance caught many off guard - ensured shareholders were spared from what was set to be the worst results-day reaction since at least 2007. Adding to the caution was Facebook’s record one-day slump just three weeks ago, as well as disappointing earnings from another Hong Kong favourite: Sunny Optical Technology Group. Sentiment around China’s technology stars, some of the country’s best-known and biggest companies, has soured. MSCI's China tech gauge has lost 9% just this week, trading at the lowest valuation relative to a US equivalent in nearly seven years. It was one of the world’s most crowded trades in 2017, surging 93% and closing at a record in January. The Chinese Internet giant still has an enormous influence over Hong Kong’s equity market, despite its shrinking value: The Hang Seng Index rarely rises if Tencent is falling. That means Tencent can be blamed for about a fifth of this year’s losses in Hong Kong. The Hang Seng index is on track for a fourth monthly drop. With almost every Tencent analyst sticking to their buy ratings and targeting 12-month gains of about 46% on average from here, their optimism - if proved right - would be a much-needed lifeline for the city’s struggling stocks.